Once again crossed the border into lagerville. 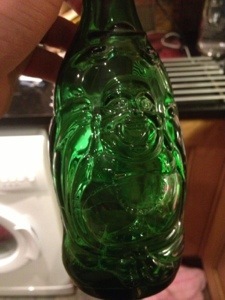 I was drawn in by the moulded green Buddha bottle. I only bought it because I’d never seen it before. Cool bottle, but not a keeper beer. 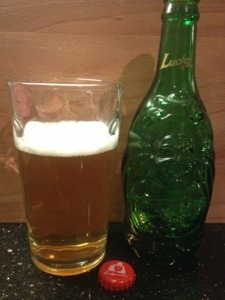 This entry was posted in beers and tagged china, lager, lucky. Bookmark the permalink. Ha! Agreed, not a very good beer – tastes pretty much exactly as you’d expect a Chinese lager to – but it’s a nice, quirky bottle. I’ve kept the empty on my shelf.